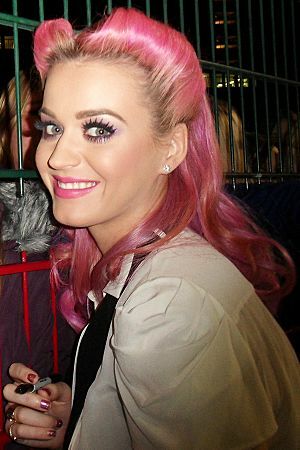 Perry rose to fame in 2008 with the release of her second album, a pop rock record titled One of the Boys. 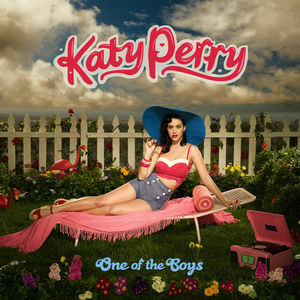 Her third album, Teenage Dream (2010), ventured into disco, and was her first album to top the U.S. Billboard 200. The album became the first by a female artist to produce five number-one songs in the U.S. 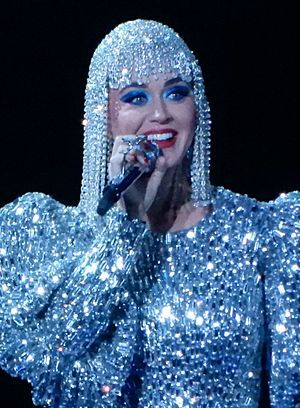 Her fourth album, Prism (2013), was her second to peak atop the U.S. charts. It is influenced by pop and dance, and she became the first artist with multiple videos to reach one billion views on Vevo with the videos for its songs. Her fifth album, Witness (2017), delved into electropop and became her third album to reach number one in the U.S. Its most successful single, "Chained to the Rhythm", broke the record for Spotify's most streamed track by a female artist within 24 hours upon its release. Perry has received various awards, including four Guinness World Records, five American Music Awards, a Brit Award, and a Juno Award, and has been included in the annual Forbes lists of highest-earning women in music from 2011–2018. Her estimated net worth as of 2016 is $125 million. She is one of the best-selling music artists of all time, having sold more than 40 million albums and over 100 million records globally throughout her career. 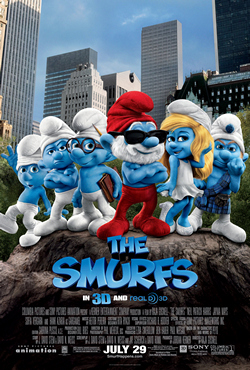 In film, she released an autobiographical documentary titled Katy Perry: Part of Me in 2012, and voiced Smurfette in the 2011 film The Smurfs and its sequel in 2013. Perry also began serving as a judge on American Idol in 2018. Katheryn Elizabeth Hudson was born in Santa Barbara, California, to Pentecostal pastors Mary Christine (née Perry) and Maurice Keith Hudson. Her parents are born again Christians. She has a younger brother named David, who is a singer, and an older sister, Angela. From ages 3 to 11, Perry often moved across the country as her parents set up churches before settling again in Santa Barbara. Growing up, she attended religious schools and camps, including Paradise Valley Christian School in Arizona and Santa Barbara Christian School in California during her elementary years. Perry primarily listened to gospel music, as secular music was generally discouraged in the family's home. She discovered popular music through CDs she sneaked from her friends. Perry began singing by practicing with her sister's cassette tapes. She performed the tracks in front of their parents, who let her take vocal lessons. She began training at age 9, and was incorporated into her parents' ministry, singing in church from ages 9 to 17. At 13, Perry was given her first guitar for her birthday, and publicly performed songs she wrote. She tried to "be a bit like the typical Californian girl" while growing up, and started rollerskating, skateboarding, and surfing as a teenager. Perry's brother David described her as a tomboy during her adolescence. She took dancing lessons and learned how to swing, Lindy Hop, and jitterbug. Perry completed her General Educational Development (GED) requirements at age 15, during her freshman year of high school, and left Dos Pueblos High School to pursue a musical career. She briefly studied Italian opera at the Music Academy of the West in Santa Barbara. Perry was declared the Top Global Female Recording Artist of 2013 by the International Federation of the Phonographic Industry (IFPI). According to Recording Industry Association of America (RIAA), she is the fifth top digital singles artist in the United States. She also became the first artist to have three songs receive Diamond certifications from the RIAA with "Dark Horse", "Firework", and "Roar". All three of them and "E.T. ", "California Gurls", and "Hot n Cold" have each sold over 5 million digital copies. Throughout her career, Perry has sold more than 40 million albums and over 100 million records globally, making her one of the best-selling music artists of all time. Perry has supported various charitable organizations and causes during her career. She has contributed to organizations aimed at improving the lives and welfare of children in particular. In April 2013, she joined UNICEF to assist children in Madagascar with education and nutrition. On December 3, 2013, she was officially named a UNICEF Goodwill Ambassador. 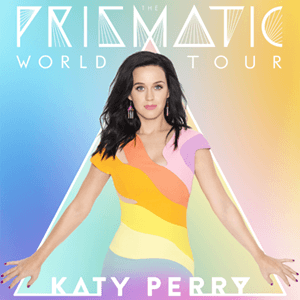 She arranged for a portion of the money generated from tickets to her Prismatic World Tour to go to UNICEF. In September 2010, she helped build and design the Boys Hope/Girls Hope foundation shelter for youth in Baltimore, Maryland along with Raven-Symoné, Shaquille O'Neal, and the cast of Extreme Makeover: Home Edition. She has also supported children's education and well-being. All profits from sales of the album The Gay Nineties Old Tyme Music: Daisy Bell, which includes her rendition of "Daisy Bell (Bicycle Built for Two)", were donated to the charity Little Kids Rock, which supports musical education in underprivileged elementary schools. In June 2014, she teamed up with Staples Inc. for a project entitled "Make Roar Happen" which donated $1 million to DonorsChoose, an organization that supports teachers and funds classroom resources in public schools. In May 2016, she worked with UNICEF to improve child care quality in Vietnam. The following month, UNICEF announced that Perry would receive the Audrey Hepburn Humanitarian Award "for her work as a UNICEF Goodwill Ambassador in support of the world's most vulnerable children" at their annual Snowflake Ball in November. Perry has supported organizations aimed at aiding people suffering with diseases including cancer and HIV/AIDS. She hosted and performed at the We Can Survive concert at the Hollywood Bowl in Los Angeles, California, on October 23, 2013. The concert's profits were donated to Young Survival Coalition. In June 2009, she designed an item of clothing for H&M's "Fashion Against AIDS" campaign, which raises money for HIV/AIDS awareness projects. On February 26, 2017, she served as a co-chair alongside various celebrities such as Beyoncé, Lea Michele, Jim Carrey, Jared Leto, and Kevin Spacey for the 25th Annual Elton John AIDS Foundation Academy Award Party, a fundraiser for HIV/AIDS healthcare. The proceeds from Perry's single "Part of Me" were donated to the charity MusiCares, which helps musicians in times of need. During her California Dreams Tour, she raised over $175,000 for the Tickets-For-Charity fundraiser. The money was divided between three charities: the Children's Health Fund (CHF), Generosity Water, and The Humane Society of the United States. On her 27th birthday, Perry set up a donations page for the Society for the Prevention of Cruelty to Animals Auckland, and set up a similar page benefiting the David Lynch Foundation for her 28th birthday. On March 29, 2014, she helped raise $2.4 million for the Museum of Contemporary Art in Los Angeles along with other celebrities such as Ryan Seacrest, Pharrell Williams, Tim Allen, Lisa Edelstein, and Riley Keough. In March 2018, Perry announced Witness: Coming Home, a benefit concert that was held in her hometown of Santa Barbara, California on May 19, 2018. The concert benefited those recovering from the aftermath of the 2017 California wildfires and 2018 Southern California mudflows. Perry performed at the One Love Manchester benefit concert for the victims of the 2017 Manchester Arena bombing amongst various other performers including its organizer Ariana Grande, which was broadcast live on June 4, 2017 through radio and various television stations throughout the world. Katy Perry Facts for Kids. Kiddle Encyclopedia.